Thinking back to movies like The Innkeepers, The Witch, and It Comes at Night, it becomes clear that not everyone is a fan of slow-burn horror movies. While all three of the aforementioned movies earned critical acclaim, the reception from average moviegoers wasn’t quite as warm. In an era where Blumhouse reigns supreme, it’s not surprising to see that audiences aren’t big on horror movies that can’t get to the point. Those who can’t stand slow pacing should avoid this year’s Pyewacket. It dedicates a lot of time to exposition, and even after the exposition is said and done, the movie isn’t exactly an adrenaline rush. It takes an artsier, more emotional approach a la the A24 horror releases, and that’s perfectly okay. The film seeks to leave an emotional impact while simultaneously leaving viewers unsettled. The horror comes from the haunting atmosphere rather than back-to-back jump scares. This essentially means that viewers need to enter the movie keeping that factor in mind. The drama sits alongside the horror, and to be completely honest, both aspects work really well together. The problem is that some viewers will want the movie to overwhelmingly lean in one direction. Just trust the folks who tell you patience is a virtue. It truly is in this case. Let it be known that Pyewacket isn’t quite as thought-provoking as many of the other slow-burn hits. It’s no Hereditary. Some of the exposition fails to make much of an impression, the payoff isn’t quite as shocking as some would expect, and the characters all fit into uninspired archetypes. However, flaws aside, Pyewacket stands head and shoulders above most of the horror movies from 2018. It’s a treat despite its flaws, and it’s the perfect Halloween treat. Remember the James Gunn-produced Belko Experiment? For those who don’t know, it revolves around a bunch of people in an office who are made to kill one another. The concept sounds cool in theory, but the overall results were lackluster. Shortly after the release of The Belko Experiment came a movie that took the same basic concept and improved upon it in virtually every way. That movie was called Mayhem. It also revolves around employees who are, for some reason or another, forced to go on some type of killing spree. 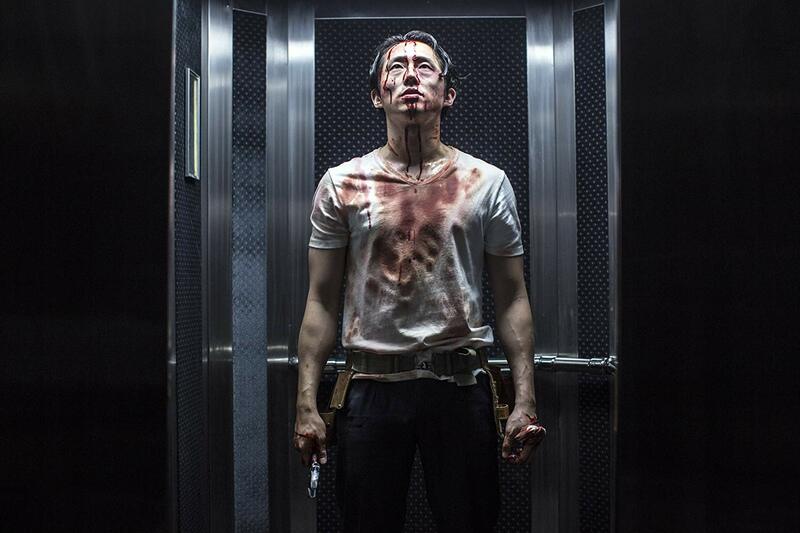 However, while The Belko Experiment was serviceable at best, Mayhem ditches the failed social commentary which ultimately results in a more pleasurable viewing experience. Let’s move past the comparisons and just talk about why Mayhem is such a success. The plot revolves around a virus that gives people an irrational urge to kill. In other words, the movie isn’t trying to be groundbreaking or thought provoking. The goal here seems to be no-frills entertainment featuring unlimited blood splatter and pitch-black humor. Described as “balls-to-the-walls cinematic anarchy,” it’s hard to fault the movie for an overall lack of ambition. This isn’t trying to Let the Right One In. It’s just trying to be 86 no-nonsense minutes of chaos. It’s hard to deny the fact that it’s a monumental success in that regard. With all of that being said, this will not check off any boxes for people looking for anything scary or deep. The action horror setup leans more heavily on action than horror. Yes, it is technically a horror film, but it never tries to be nightmare fuel. Scaring the audience is low on the to-do list. Similarly, the team behind the movie doesn’t care whether or not viewers get some new insight into life. They just want people to have a good time. For most people, that should be pretty easy. Sometimes it’s best to approach a movie completely blind. Don’t watch the trailer, don’t read the summary, don’t even read any reviews. That’s how Blood Punch should be viewed. So technically this is sort of a mini review, but it’s going to be kept brief because, seriously, you don’t want anything spoiled. A combination of pitch black humor, rapid fire editing, and hair-raising suspense results in a movie that’s well worth watching. It’s not purely a horror movie by any means, but the mixing of genres is undoubtedly a positive rather than a negative. Blood Punch never feels like a failed Frankenstein’s monster of mismatched parts. Even though it’s a few too many ideas rolled into one movie, these ideas go together. In fact, they go together in a way that they really shouldn’t. An unskilled filmmaker would no doubt make this feel like a tonally jarring nightmare. In her directorial debut, Madellaine Paxson has a stronger grip on tone than some seasoned horror directors. Unfortunately, it’s hard to go into too much detail beyond that. Just be aware that the crew took a bizarre premise and miraculously made it work. The tone is perfect, the story is surprisingly deep, and the characters are likable. The only downside is the fact that it’s a little too ambitious for its own good. Regardless, the ambitions are mostly for the betterment of a very entertaining movie. 11. What Keeps You Alive? With 995 measly IMDb votes at the time of writing, What Keeps You Alive really is a horror movie most people didn’t see. The incredibly recent release date is clearly one of the problems, but the lack of advertising and quiet VOD release seems like another problem. It may not be the talk of the town, but this grisly Canadian thriller seriously deserves attention. It’s not a horror movie in the traditional sense, but it should satisfy viewers thirsty for some macabre thrills. What Keeps You Alive? is an example of a movie that benefits from unparalleled craftsmanship both in front of and behind the camera. After all, it’s not earning any points for creativity. On the contrary, What Keeps You Alive borrows ideas from basically every other horror movie. What sets it apart is the fact that it’s ridiculously well-made. The performances are breathtaking. The cinematography is gorgeous. Everything about the movie stands head-and-shoulders above the competition. So, lack of innovation aside, there’s a lot to appreciate here. Groundbreaking horror is great and all, but if a director can find a way to make a tired concept feel invigorating, good on him or her. As long as viewers are aware of the fact that this movie follows a formula, they should leave the screen feeling mighty impressed. Not everything in 2015’s Let Us Prey is entirely original. Especially in the first act, this is a horror homage above all else. Having said that, the movie eventually loosens up and tries its hand at something a little more modern. To some extent, the two halves feel a bit jarring. At the same time, they’re both invigorating enough to warrant an entire viewing. Let Us Prey tries to do a lot and it mostly succeeds. The only downside is a potential lack of mainstream appeal. Similar to a couple other movies on this list, the less known about Let Us Prey, the better. It’s not that this is some kind of introspective mind boggler. No, it’s just that there’s a whole lot going on and it’s fun to watch it unfold with little to no knowledge beforehand. There are some twists and turns that are better left unspoiled, but a lot of the joy comes solely from the onscreen carnage. Technically, a little background knowledge wouldn’t ruin the carnage, but it would all feel a little more surprising without background knowledge from trailers, reviews, are synopses. As previously mentioned, this movie is meant for horror fans more than casual moviegoers. The throwbacks constantly seem to wink at audience members while the slow beginning lacks the punch that modern viewers are used to. Regardless, this is a movie that knows its audience and happily goes with the flow. Due to the fact that slow burn movies have such a limited appeal, it only seems fair to provide some type of warning whenever one appears on this list. Casual horror watchers are impatient, which means they don’t always have time for movies that drag out the horror as long as possible. While The Night Eats the World jumps straight into the horror, it certainly doesn’t jump straight into the action. 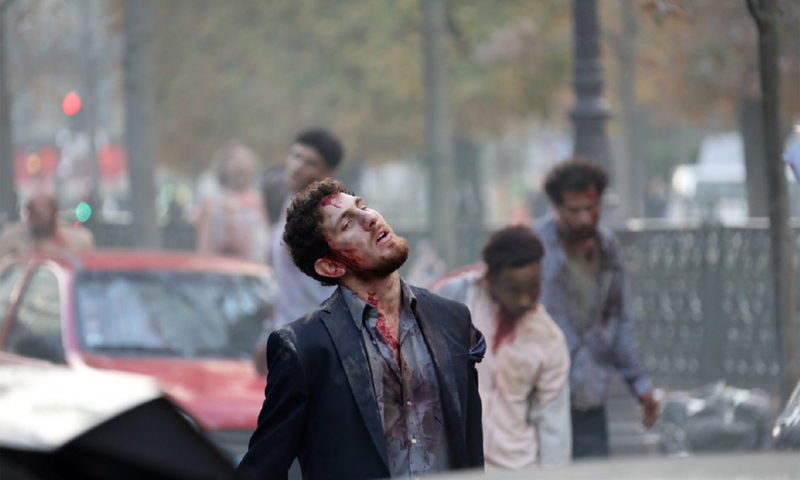 The zombies appear within the first ten minutes, but meat of the story requires some patience. Although the slow start will deter some viewers, it’s actually part of the charm. Let’s face it, this movie is part of a crowded genre. Zombie movies are almost carelessly dumped onto unsuspecting viewers who have seen this story time and time again. We all know the story about a group of people who band together because they’ve managed to make it so far in a zombie apocalypse. Some of them catch the virus by the end of the movie, but the survivors all form some sort of bond. Yawn, how about a little creativity every now and then? In comes The Night Eats the World, which ditches the ensemble approach and instead (mostly) focuses on a single person. Sure, I Am Legend did that back in 2007, but the more introspective approach helps this movie stand out. While the Will Smith blockbuster featured plenty of dialogue and plenty of action, this movie skips the chatter in favor of slow-building dread. The almost (but not quite) unbearably slow pacing provides a challenge for restless viewers, but there’s certainly a reward waiting. Of course, there are also people who will appreciate the buildup. Those people get double the reward. This is especially true since, slow pacing aside, there is a decent amount of humor in that first half. Regardless of viewer patience, this is a movie that most people will enjoy. It’s just a matter of whether or not they will enjoy it immediately. Some will struggle to sit through scenes of the lone wolf protagonist dancing in a deserted kitchen. Others will get a kick out of it while they wait for the main attraction. The point is, that main attraction is worth it. Beyond the Gates was made for people who thought Jumanji wasn’t supernatural enough. It revolves around two brothers who look through their missing dad’s items only to discover a fishy looking VCR board game titled Beyond the Gates. That fishy looking board game, they soon come to discover, may be the key to finding their missing father. Like Jumanji or Zathura, the twist is that the board game is anything but a board game. Each scenario leads to something rather sinister. This of course results in the two brothers desperately trying to survive. The whole “trying to survive” part is the main attraction, but the ‘80s aesthetic is where this movie sets itself apart. Throwbacks to the 1980s seem to be all the rage right now. From Stranger Things to It, everybody seems to be jumping on this nostalgia-fueled bandwagon. With some movies or shows, it seems cheap. With Beyond the Gates, it feels authentic. It’s clear that the pair of directors really wanted to transport viewers back to “simpler” times. Even when it seems gimmicky, it’s hard to complain because the setting is the star of the show. Downsides come from the microbudget and occasional pacing issues. Some movies have every right to be dialogue-driven, but it just feels awkward in Beyond the Gates. When everyone is trying to see the next twisted step in the board game, long bouts of chatter tend to slow things down. Additionally, some of the aesthetic choices would no doubt look better with budget in the millions. Still, these flaws are forgivable because, as stated, this twisted time capsule offers up plenty of enjoyable moments. Let’s get the bad news out of the way first: Tragedy Girls is not the meta classic it wants to be. It’s not even in the same league as Scream or Cabin in the Woods. Heck, it’s even a hair below The Final Girls. Then again, if it received the same amount of positive attention as those movies, it probably wouldn’t sit in the latter half of this list. Frankly, it’s not as smart as it thinks it, but that’s okay. It makes up for its lack of intelligence by being really, really fun. It’s hard to slam a movie that takes its premise and has a blast with it. Tragedy Girls is basically a nastier version of Heathers. Two morbid teens obsessed with death band together to become social media superstars. Their approach to superstardom is a little unorthodox in that it mostly revolves around killing people and trying to create a serial killer cover story about it. In other words, the premise is pretty damn clever despite the fact that tongue-in-cheek approach never breaks new ground. It doesn’t really need to though. Clever dialogue and entertaining kills should be enough to keep most viewers distracted.